The Evenflo Embrace 35 Infant Car Seat combines safety and comfort with exclusive convenience features. With the exclusive lightweight design, you won't have to worry about your arm getting tired while on the go. Your baby will be comfortable in the Evenflo Embrace 35 Infant Car Seat with a removable pad plus head and body pillow, and pivoting canopy. This Evenflo Embrace Infant Car Seat can be used with or without the base and additional bases can be purchased. See all car seats on Walmart.com. Shop car seats including convertible car seats and booster car seats. Save money. Live better. 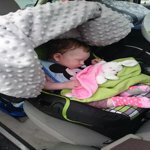 I bought this car seat while pregnant, and I fell in love. My son is now 4 months old and we STILL love it! With a lot of car seats, babies heads end up falling forward. Not with this one! With the plush head rest, my sons' head stayed in place! I LOVE this seat! The sensor safe technology is worth every penny. I don't have to worry about my son in the back seat. The best part about the sensor safe is it works! There hasn't been a hiccup in the system! The only infant car seat I would ever buy! Plus, it connects to my Jeep stroller! We have these had these seats since our twins were born 5 months ago and we have nothing but good things to say! They are cute, easy to use, lightweight, and well-made. When our girls were first born they were about 6 lbs each and the headrest kept their little heads up so well. When they got bigger it was easy to adjust the straps and remove the headrest. And now that they are almost 15 lbs each I am glad we got these car seats instead of heavier ones that would be way harder to cart around. Love love love these car seats!! I purchased this product over the internet and must say that the between the shipping and delivery, everything came in a timely fashion. While I have yet to use the car seat I can definitely say that what you see is what you get. I chose this particular style because I felt that it would conceal dirt a lot better than other designs. My only complaint is in regards to the canopy. I thought it would be flexible but its not. There is a velcro attachment behind the car seat to keep the canopy in place but it does not come out very far. But in my opinion it is not something that's a deal breaker for me. The seat itself is very light weight and my favorite part is that according to the instructions it is machine washable which is a plus. I also like that it comes with a detachable headrest and I am curious to see if this seat will hold up to its weight and height specifications which is mainly why I purchased this seat. This is a perfect fit for our new grandaughter. LaMya is four pounds 11 OZ when she was released. The head section was very important to us to keep her safe. As with most discharges LaMya was evaluated in the seat prior to being released. Seat is easy to install and adjust. The ability to lock the seat onto a shopping cart is a great safety feature that some of the more expensive seats don't have. The padded headrest protects the baby's neck very well too. The only weak spot is the bonnet or shield. It does not want to stay fully extended sometimes. It takes a bit of tweaking to get it to stay in place. I love this car seat for a few reasons. I like that you can adjust the straps without have to take it apart from the back. I love the head rest also. My daughter is tiny. She weighs 11 lbs and is 5 months old and this car seat is perfect for her. Only thing that i don't like about it is that the car seat is fading a little. I bought it brand new so it shouldn't be fading any. I do wash it a lot because my daughter spits up A LOT! I also don't like how there are holes where the straps come up from around the legs. When my daughter spits up it runs down and out of the car seat and leaks all over the place. Would of been much easier to clean up with just a spit up rag and soak it up that way. Instead it leaks into the base of the car seat and i have to clean it out every day. But i used a graco car seat with my son and this is way better. I gave birth to a 5lb 13oz baby boy who was 19 inches long. When I went to try him in the car seat he didn't fit at all. The specs for the seat say 4lbs to 35lbs and starting at 19 inches long. I had the straps hooked to the little one inch sewed slot that hooks to the tightening piece. When I tightened the seat all the way down this is what I got. If you have small children don't buy this seat.